HBV infection is a major cause of liver cirrhosis and hepatocellular carcinoma. Although HBV infection can be efficiently prevented by vaccination, and treatments are available, to date there is no reliable cure for the >240 million individuals that are chronically infected worldwide. Current treatments can only achieve viral suppression, and lifelong therapy is needed in the majority of infected persons. In the framework of the French National Agency for Research on AIDS and Viral Hepatitis ‘HBV Cure’ programme, a scientific workshop was held in Paris in June 2014 to define the state-of-the-art and unanswered questions regarding HBV pathobiology, and to develop a concerted strategy towards an HBV cure. This review summarises our current understanding of HBV host-interactions leading to viral persistence, as well as the roadblocks to be overcome to ultimately address unmet medical needs in the treatment of chronic HBV infection. The French ANRS (National Agency for Research on AIDS and Viral Hepatitis) recently created the ‘HBV Cure’ programme to (i) promote basic and translational science studies, (ii) shape the organisation of HBV research in France and (iii) foster international collaborations in the field of HBV, similarly to what has been implemented with the HIV Cure Initiative.7 A coordinated action has been launched in 2014, and a first scientific workshop was organised on 17 June 2014 in Paris to bring together researchers, clinicians and pharmaceutical companies to define the current state-of-the-art and unanswered questions in HBV pathobiology in order to develop a concerted strategy towards an HBV cure. In this review, we summarise key unanswered questions both at clinical and basic research levels as well as our current understanding of HBV host-interactions leading to viral persistence (boxes 1 and 2). We also highlight the roadblocks that were addressed during the workshop, which need to be overcome in order to fulfil unmet needs in the treatment of chronic HBV infection. Advance our understanding of viral and host factors involved in the pathogenesis of chronic HBV infection in order to improve strategies for chronic hepatitis B management and treatment. Identify biomarkers of disease progression to efficiently prevent cirrhosis and hepatocellular carcinoma (HCC). Assess the impact of treatment of immune-tolerant patients or inactive carriers on the prevention of cirrhosis and HCC. Identify appropriate short-term and long-term endpoints to define an HBV cure. Develop new classes of antivirals and therapeutic strategies, including combination therapies, to ultimately cure the majority of patients with chronic hepatitis B. Uncover the molecular mechanisms of HBV entry. Characterise the molecular mechanisms underlying formation and regulation of covalently closed circular DNA. Determine the exact role of the hepatitis B X protein. Develop novel in vitro models for the study of viral dissemination. Assess the role of innate immunity in HBV clearance. Identify virus-specific determinants of HBV-specific T cell exhaustion involved in viral persistence. Understand the role of B cells in the control of HBV infection. Characterise the mechanisms involved in HBV-induced hepatocellular carcinoma. Cohort studies are very valuable to better understand the natural course of HBV infection. Before the implementation of a mass vaccination programme, Taiwan had one of the highest rates of HBV infection in the world with a 15–20% HBsAg carrier rate, liver cancer representing the second leading cause of mortality in this country.21 ,22 This nationwide vaccination programme led to a dramatic decrease in HBsAg prevalence and incidence of liver cancer.23 ,24 Furthermore, within the past years, the clinical outcomes of Taiwanese patients with HBV have been thoroughly studied in three large cohorts of patients (REVEAL-HBV, SEARCH-B and ERADICATE-B). This led to the identification of several factors associated with disease progression. The risk factors for a greater risk of HCC include male gender, age, high alanine aminotransferase (ALT) levels, high HBV DNA levels, high HBsAg levels and HBV genotype C.25 First, HBV viral load is a strong independent risk predictor for cirrhosis and HCC in patients aged 30 or older, patients with persistently high HBV DNA levels having the highest risk of liver disease progression;26 ,27 the risk of HCC development in patients with high HBV levels and normal ALT remains to be determined. In clinical practice, the close monitoring of HBV viral load may help define which HBV carriers aged 30 or older are at high risk of developing cirrhosis and HCC. Second, in spontaneous HBeAg seroconverters with HBV genotype B or C infection, a low serum HBsAg level at the early HBeAg-negative phase was associated with a higher HBsAg loss rate. However, serum HBV DNA levels were a better predictor than HBsAg levels of disease progression in spontaneous HBeAg seroconverters.28 ,29 Third, despite the lack of correlation between pre-core/core promoter HBV variants and HBeAg-negative hepatitis, a major proportion of basal core promoter mutants was associated with an increased risk of cirrhosis for patients with high viral load.30 Thus, persons with high frequency of core promoter mutants should be considered to receive early therapy. Taken together, the findings from these cohort studies suggest that HBV DNA and HBsAg are complementary markers for the risk of disease progression.31 Moreover, these results led to the definition of an algorithm to categorise disease progression in Asian HBV carriers. The algorithm provides a risk score for development of HCC, which may thereby improve the clinical management of patients with chronic HBV.31 ,32 Nevertheless, to date the costs for assessing the different risk parameters remain an economic issue and thus more cost-effective risk calculators are currently being developed. Moreover, it was recently described that the risk of HCC cannot be confidently predicted using HCC risk scores at baseline nor during therapy in Caucasians.33 Currently, international liver societies recommend antiviral treatment only during the inflammatory phase of the disease. The goal of antiviral therapy is the prevention of disease progression towards end-stage liver disease and HCC. Nevertheless, even subjects in ‘inactive carrier’ stage can develop liver cancer in the long term, and this may be an issue for individuals that have been infected very early in life.34 A better understanding of time course of HBV pathogenesis is required to better predict disease progression and improve the clinical management of chronic hepatitis B. With this in mind, ANRS launched CO22 HEPATHER, a large French cohort that aims to include 10 000 patients with viral hepatitis B from 32 clinical centres and gather clinical and therapeutic data, biological collections and quality-of-life criteria. Subjects will be followed for 8 years and about one million biological samples will constitute an unprecedented biobank. This cohort will enable scientists to better describe the progression of chronic viral hepatitis in the long term and identify associated prognosis factors, including biomarkers. It will also allow evaluation of clinical effectiveness and safety of treatments in ‘real-life’ situation in order to identify treatments that will most likely improve overall patient health while limiting the emergence of escape variants and viral breakthroughs. Moreover, this cohort will define cost-effective strategies for the management and treatment of chronic viral hepatitis. Finally, it will provide resources for clinical trials or research on biomarkers in tailored subpopulations. To achieve a cure for chronic hepatitis B, it is important to discuss the definition of the concept of ‘HBV cure’ and endpoints of antiviral treatment. In theory, the virological definition of cure would be the eradication of cccDNA (as the ultimate goal), but in practice the clearance of HBsAg would be more easily achievable in a shorter term. A definition of a functional cure would be HBsAg seroconversion even in case of liver cccDNA persistence, along with cessation of liver disease35 (table 1). When viral eradication is not achievable, lowering of liver cccDNA levels, inactivation of cccDNA-directed transcription to prevent viral replication and induce a remission of liver disease could be a realistic endpoint. However, aiming for an inactive carrier status is probably not ambitious enough given that these subjects remain at risk for developing HCC.33 ,34 Moreover, the long-term consequences of HBV genome integration will have to be taken into account even following viral eradication or control. It is worth noting that persons who clear HBV infection after a chronic infection have a greater risk of developing HCC than individuals who have not been infected with HBV.36 ,37 Moreover, patients that resolved an infection may see virus reactivation, with attendant liver disease, in case of immunosuppressive therapy for cancer, autoimmune disease or organ transplantation.38 Therefore, in the near future, the aims of the field are to (i) advance our understanding on the viral and host factors involved in HBV pathogenesis, including innate and adaptive antiviral immune responses; (ii) uncover biomarkers of disease progression in order to identify patients with minimal hepatitis who are at risk of developing cirrhosis and HCC and (iii) define new targets for antiviral therapy to achieve an HBV cure. 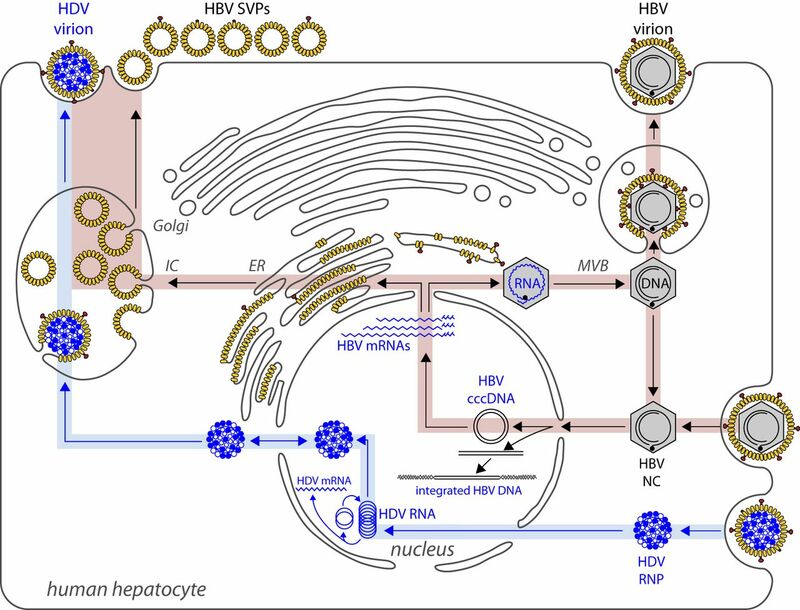 Schematic overview of the HBV/hepatitis delta virus (HDV) life cycles. cccDNA, covalently closed circular DNA; MVB, multivesicular bodies; RNP, ribonucleoprotein; SVP, subviral particles. Several steps of the HBV life cycle are now known in detail, but the mechanisms of viral entry, cccDNA formation and regulation, intracellular trafficking and morphogenesis, as well as interaction with the host immune system, are still poorly understood. This lack of information is due to the difficulties encountered in obtaining a robust tissue culture system (table 2) and the lack of practical animal models recapitulating the HBV life cycle and pathogenesis (table 3). Human hepatocytes are the natural target cells of HBV and HDV. These cells can be isolated from liver resections and retain susceptibility to HBV infection for a short period in culture.42 However, the accessibility to fresh human liver resections, the quality and the variability of the individual preparations limit their use. In the mid-1990s, several laboratories showed that primary hepatocytes of Tupaia belangeri were also susceptible to HBV infection (reviewed in refs. 43 ,44). Although primary tupaia hepatocytes are valuable to study HBV infection, the difficulty to rear these animals and the absence of tupaia-specific reagents for functional studies limit their use. To bypass the hurdles to using primary cell cultures, human hepatoma Huh7 and HepG2 cell lines were used for many years to perform in vitro experiments on HBV. Although those cells are permissive to HBV replication and viral particle assembly, they are not susceptible to infection due to the lack of expression of the receptor(s) and thus only allow study of post-transcriptional steps of the HBV life cycle after plasmid transfection. Alternatively, the HepaRG cell line, described in 2002, can be used for in vitro studies. HepaRG cells are liver progenitors that become susceptible to HBV and HDV infection after differentiation in culture.45 However, infection rates are low and virus spread within the cultures was never observed. Since the recent discovery of sodium taurocholate co-transporting polypeptide (NTCP) as an HBV/HDV receptor,46 ,47 HepG2 and Huh7 cell lines (over)-expressing NTCP have been generated. These cells are susceptible to HBV and HDV infection, but their capacity to allow virus propagation remains to be determined as does their relevance, because of their transformed nature, for studies of virus–host cell interactions. Finally, a recent study showed that micropatterning and co-culturing of primary human hepatocytes or induced-pluripotent stem cells differentiated into hepatocyte-like cells with fibroblasts maintains prolonged HBV infection,48 a model eventually amenable to study virus–host interactions and antiviral drugs affecting early infection steps. While cell culture models are very valuable to characterise defined aspects of the viral life cycle, in vivo models are necessary to study HBV pathogenesis and new antiviral strategies including immunotherapies (table 3). HBV has an extremely narrow host range since it only infects hominoid apes including chimpanzees. The latter have been used in pivotal studies deciphering host responses during acute HBV infection49 ,50 but are no longer available for experimental studies.51 Therefore, macaques, which have a 93% sequence identity with humans and are highly used in toxicology, have been considered as an alternative model to study viral hepatitis. In addition, a naturally occurring, transmissible, chronic HBV infection has been found in cynomolgus macaques from Mauritius with a prevalence of 53%. The viraemia lasted up to 9 months and interspecies transmission was possible to the sylvanus macaques of Morocco.52 It was found that the preS1 binding site in sylvanus macaques NTCP is identical to that of Macaca fascicularis in bearing substitutions at positions 157–158 (Isabelle Chemin, personal communication) that were described as detrimental to an HBV receptor function.46 ,53 Further studies are required to improve the robustness of the model before using macaques as an alternative to chimpanzees and for developing immunotherapeutic approaches. There are also various HBV-related viruses such as duck HBV, woodchuck HBV and ground squirrel HBV that have been invaluable models to study HBV infection. The woodchuck is one of the best models available and has been used to explore many aspects of Hepadnaviridae biology such as the pathogenesis of the infection, new vaccines, therapeutic vaccination, drug toxicity and antiviral drugs.54 However, this is an expensive model with a very limited number of animals available from commercial sources. In addition, there is a series of limitations: cancer development is strikingly different to humans as woodchucks integrate linearised genomes close to N-myc; the metabolism changes with their hibernation limiting the time during which studies can be performed; and sophisticated immunological tools that would allow an examination of the virus-specific immunological responses are lacking. Mice are naturally not susceptible to HBV infection, but they can be humanised to study HBV infection in vivo. Four murine models have been used to generate human liver-chimeric (HuHEP) mice: urokinase-type plasminogen activator-severe combined immunodeficiency (uPA-SCID), FRG (Fah−/− Rag2−/− IL2Rγc−/−), thymidine kinase (NOD/Shi-scid/IL-2Rγnull) (TK-NOG) and AFC8.55 These mice are characterised by a progressive degeneration of mouse liver cells and immunodeficiencies, thereby allowing engraftment of human hepatocytes. Re-population of the liver by human hepatocytes is monitored by determination of the human albumin levels in the serum of the mice. Recently, an 'ANRS Consortium on Humanized Mouse Models for Viral Hepatitis' was created to develop, compare, optimise and master HuHEP models in France and for share with the ‘viral hepatitis’ research community. The ANRS consortium focuses on three main models: FRG, uPA-SCID and BRGS (BALB/c Rag2−/− IL-2Rγc−/− SIRPα.NOD) uPA models. FRG mice have a triple knock out: fumaryl acetoacetate hydrolase (FAH)−/−, Rag2−/− and IL2Rγc−/−. The knock-out of FAH induces liver toxicity, which can be controlled by administration of NTBC 2-(2-nitro-4-trifluoromethylbenzoyl)cyclohexane-1,3-dione to control the degree of liver damage and the engraftment of human hepatocytes postinfusion.56 Inoculation of human liver-chimeric FRG mice with HBV leads to a sustained production of HBV particles in the serum of these mice for up to 10 weeks.57 uPA-SCID mice express the uPA transgene under the control of the albumin promoter, which induces liver damage and allows subsequent repopulation with human hepatocytes.56 Inoculation of liver humanised uPA-SCID mice with HBV also leads to productive infection,58 and this model has been used for proof-of-concept studies assessing the efficacy of novel antiviral strategies (refs. 59 ,60 ,61 and reviewed in ref.62). Furthermore, human liver-chimeric uPA-SCID mice have already been used to study HBV/HDV coinfection.63 ,64 Nevertheless, the absence of a functional immune system and human liver microenvironment in these models precludes the study of defined aspects of HBV/HDV infection. To allow assessment of viral pathogenesis in the context of a functional human immune system and to test immunotherapies, a double humanised mouse, carrying both a humanised immune system and human hepatocytes (HIS-HuHEP mice), was created in BRGSuPA mice (Strick-Marchand, personal communication). Following infection with HBV, the cross-talk between the immune system and the infected hepatocytes was analysed, and a balance between proinflammatory and immunosuppressive modulators was observed in HIS-HuHEP mice (Strick-Marchand, personal communication), suggesting that this model may recapitulate key aspects of chronic viral hepatitis in patients. Finally, two immunocompetent mouse models of chronic HBV infection have been established recently by using low doses of adenovirus-associated65 or adeno-associated virus-mediated66 gene transfer of HBV. The further development of such small animal models will allow testing of novel therapies combining direct-acting antivirals (DAAs) with immunomodulatory drugs, as well as the consequences of coinfection by hepatic viruses and HIV. cccDNA is responsible for HBV persistence in the liver and even a single copy could theoretically reactivate full infection. Despite >30 years of molecular biology study on HBV, little is known about how cccDNA is formed and regulated. A better understanding of these mechanisms will probably be instrumental to curing HBV infection. cccDNA is exclusively produced from rcDNA, either from incoming virions or from neoformed nucleocapsids, probably by a multistep process including (i) the removal of the polymerase (P) protein covalently linked to the minus strand of rcDNA, (ii) removal of the RNA primer covalently linked to the plus strand of rcDNA, (iii) generation of exactly one unit length double-stranded DNA and (iv) ligation of the ends of both strands. It is believed that most of these activities are provided by the host cell. A very recent study uncovered the mechanism of P protein removal from rcDNA.86 Indeed, it was demonstrated that tyrosyl-DNA-phosphodiesterase (TDP)2 can specifically cleave the Tyr–DNA bond and release P protein from authentic HBV rcDNA in vitro. Moreover, interfering RNA (RNAi)-mediated TDP2 depletion in human cells significantly slowed down the conversion of rcDNA to cccDNA, while ectopic TDP2 expression in the same cells restored conversion kinetics.86 These data strongly suggest that TDP2 is one but likely not the only host DNA-repair factor involved in HBV cccDNA biogenesis. Once formed, cccDNA persists as a minichromosome in the nucleus of infected cells87 ,88 and the regulation of its transcription occurs through epigenetic modulations. Using chromatin immunoprecipitation assays (ChIP), it has been shown that modification of histones bound to cccDNA regulates its transcriptional activity. Indeed, HBV replication parallels the acetylation status of HBV cccDNA-bound H3 and H4 histones in HBV replicating cells and in patients.89 A number of transcription factors, chromatin-modifying enzymes as well as viral proteins (ie, HBc and HBx), were identified as cccDNA-bound and involved in its modulation88 ,90 HBx was shown to be necessary for the transcription from cccDNA through epigenetic regulation.90 ,91 However, studies of the epigenetic regulations of cccDNA are still limited in current HBV replication models. Indeed, the detection limit of ChIP assays is 0.2 cccDNA copies per cell and 0.5–1 cccDNA copies per cell are necessary to assess multiple parameters in the same biopsy sample, but it also depends on the number of infected cells in the sample. Following cccDNA transcription by host RNA polymerase II into HBV mRNAs in the nucleus and translation of the latter to viral proteins, assembly of core protein subunits with pgRNA into nucleocapsids in the cytoplasm represents the initial step in the assembly of progeny virions. Neoformed nucleocapsids then interact with the HBV envelope proteins at a postendoplasmic reticulum, pre-Golgi compartment, before being released from the cells as mature enveloped virions through the multivesicular body pathway,92 whereas the huge excess of HBV envelope proteins that is a characteristic of an HBV-infected cell is exported as empty subviral particles through the cell secretory pathway. Some key aspects of viral assembly and dissemination of virions remain unanswered. For instance, mechanisms that are favouring secretion of neoformed nucleocapsids rather than recycling towards the nucleus and vice versa are still unclear. Virus assembly in the setting of antiviral-induced inhibition of viral DNA synthesis (for instance, by NUC) has not been studied either. Indeed, for instance, the fate of pgRNA-containing nucleocapsids (degradation or secretion) is unknown. To broaden the therapeutic landscape in chronic hepatitis B management and to ultimately achieve a reliable HBV cure, novel antivirals with original mechanisms of action are needed. Drug development thus focuses on strategies targeting cccDNA either by preventing cccDNA formation, eliminating cccDNA or silencing cccDNA transcription. Control of cccDNA should be achievable by either capsid disassembly, inhibition of rcDNA entry into the nucleus, inhibition of conversion of rcDNA to cccDNA, physical elimination of cccDNA, inhibition of cccDNA transcription (epigenetic control) or inhibition of viral or cellular factors contributing to cccDNA stability/formation. Drugs with such activity could be DAAs targeting the virus or host-targeting agents (HTAs), including inhibitors of key host factors required for the viral replication cycle and immunomodulatory agents (table 4). A complementary approach to the development of capsid inhibitors with direct impact on cccDNA pools is the design of enzymes targeting cccDNA formation or decay. Recently, a small-molecule library screen was conducted to uncover compounds inhibiting cccDNA synthesis. This led to the discovery of disubstituted sulfonamide (DSS) compounds as inhibitors of cccDNA in cell-based assays.133 DSS did not appear to directly promote the degradation of rcDNA or cccDNA but rather to inhibit de novo cccDNA formation by interfering with rcDNA conversion into cccDNA.133 Furthermore, DNA cleavage enzymes, including homing endonucleases or meganucleases, zinc-finger nucleases, TAL effector nucleases and CRISPR-associated system 9 proteins, specifically targeting the cccDNA are currently being engineered.114 ,134–136 These enzymes can be delivered as genes within viral vectors to target hepatocytes.137 Computational modelling studies suggested that several enzymes may have to be administered concomitantly in order to avoid selection of resistant viruses.114 Of note, enzyme-based strategies are currently also being evaluated in other viral infections, including HIV infection, where this approach is used in order to modify the viral receptors CCR5 and CXCR4 on T cells ex vivo (reviewed in ref.138). Further studies are needed to evaluate the potential of these novel antiviral strategies against HBV infection. Noteworthy, cccDNA transcription can be silenced to some extent using small molecules targeting different classes of chromatin-modifying enzymes, similar to the epigenetic silencing of cccDNA by IFN-α,139 ,140 which would lead to functional, although transient, HBV cure. In addition to interfering with cccDNA formation and stability, future drugs aiming at curing HBV infection may target other host cell pathways to interfere with the viral replication cycle and/or restore anti-HBV immune responses (reviewed in ref.143). The recent clinical development of HTAs for the treatment of chronic hepatitis C highlights the promise of this approach to address unmet needs in the treatment of virus-induced liver disease (reviewed in ref.144). In contrast to HCV, few HTAs targeting the HBV replication cycle have been described. These include inhibitors of the recently uncovered HBV receptor NTCP and inhibitors of HBV envelope protein maturation and secretion (reviewed in refs.81 ,113 ,145). Small-molecule compounds binding to NTCP, including cyclosporine A and ezetimibe, have been shown to inhibit HBV/HDV entry in cell culture models, and although licensed for other clinical settings, none of these compounds has so far been tested in vivo against HBV.146–148 In contrast, the well-known HBV pre-S1-derived lipopeptide Myrcludex-B that competes with HBV/HDV for binding to NTCP efficiently prevents HBV/HDV entry both in vitro and in human liver-chimeric uPA-SCID mice.64 ,79 ,149 Furthermore, this lipopeptide was also able to impair viral dissemination when administered subsequent to viral inoculation in this mouse model.59 Myrcludex-B is currently being evaluated in a phase II clinical trial in Russia. The HBV secretory pathway is another potential target for novel antivirals, as inhibiting HBV secretion and budding should decrease the release of progeny subviral particles and virions. This could not only decrease HBV DNA levels but also interfere with HBsAg-mediated immunosuppression, thereby restoring antiviral immunity. Several inhibitors of HBV secretion have been described so far, including iminosugar derivatives of butyldeoxynojirimycin and related glycolipids, α-glucosidase inhibitors, triazol-o-pyrimidine derivatives and a benzimidazole compound.145 ,150 ,151 The benzimidazole BM601 has recently been reported to selectively inhibit intracellular re-localisation of the HBV surface protein to the Golgi apparatus. Thereby, it decreases HBsAg and HBV release without affecting HBeAg secretion or induces the release of cellular proteins with an original mechanism of action compared with previously described inhibitors of HBV maturation and secretion.151 Moreover, amphipathic DNA polymers such as phosphorothioate oligonucleotides have been shown to inhibit HBsAg release, thereby contributing to immunological control of HBV infection.152 Noteworthy, such compounds exhibit broad antiviral activities and are also evaluated as HIV and HCV fusion inhibitors (reviewed in ref.144). As potential disadvantages, HBsAg accumulation could lead to storage diseases and the block of mature virion synthesis could increase cccDNA copy number. In order to circumvent the systemic side effects of IFN-α that limit its clinical use, efforts are ongoing to uncover other means of inducing intrahepatic antiviral immune responses in the infected host. Most recently, an original mechanism to activate antiviral immune responses has been described using antibodies directed against the lymphotoxin-β receptor (LTβR).153 Similarly to members of the IFN or TNF family of cytokines, antibodies activating LTβR reduced HBV DNA, HBsAg and cccDNA levels in relevant cell culture models in the absence of detectable hepatotoxicity. Antibody-mediated activation of LTβR appeared to have a dual mechanism of action, targeting both HBV replication and cccDNA stability via induction of deamination and apurinic/apyrimidinic site formation in cccDNA and upregulation of the expression of nuclear APOBEC3 deaminases.153 This approach may however imply a significant problem as the increased mutation rate may support generation of resistant variants as it was shown for HIV. The potential synergistic effect of combinations of LTβR agonists and current polymerase inhibitors remains to be assessed. The recent progress in HCV therapy with novel DAAs allowing to cure chronic HCV infection169 has created expectations of a cure for other chronic viral infections. Although HCV and HBV both target human hepatocytes and induce chronic liver disease and HCC, they are fundamentally different in terms of genomic structure and virus replication cycle. The ability of HBV to persist as cccDNA and to integrate into the host genome hampers its eradication. The recent development of novel in vitro infection models opened a new era for the study of HBV, and the time seems right to develop a concerted strategy to achieve HBV cure and reduce the burden of HBV-induced liver disease and HCC. The main challenges towards an HBV cure and the new concepts to be explored have been discussed during the ANRS workshop. The main conclusions were that the primary aims of the field are to (i) develop novel model systems to further characterise the molecular mechanisms of the HBV replication cycle, particularly the formation and regulation of cccDNA; (ii) advance our understanding on the viral and host factors involved in HBV pathogenesis, including innate and adaptive antiviral immune responses; (iii) uncover biomarkers of disease progression to better identify patients who are at risk of developing cirrhosis and HCC; and (iv) define new targets for antiviral therapy to achieve an HBV cure. A concerted action of academic centres and pharmaceutical industries will also be warranted to hasten the development of new antiviral strategies to combat HBV infection. We thank ANRS for the ‘HBV Cure’ initiative. Details about the latter can be found using the following link: http://www.anrs.fr/Hepatites-virales-B-et-C/Clinique/Actualites/Une-nouvelle-priorite-a-l-ANRS-HBV-Cure. We would also like to acknowledge Ventzislava Petrov-Sanchez and Alexandra Rohel for their contribution to organising the first HBV Cure workshop. The members of the ANRS HBV cure coordinated action (AC34) are the following: Laurent Abdel, Matthew Albert, Tarik Asselah, Brigitte Autran, Thomas Baumert, Marc Bourlière, Stephane Bressaneli, Bruno Canard, Fabrice Carrat, Christophe Combet, François-Loïc Cosset, Paul Dény, Jean Dubuisson, David Durantel, Emmanuel Gordien, Jeremie Guedj, Michaël Kann, Karine Lacombe, Maasimo Levrero, Marie-Louise Michel, Christine Neuveut, Johan Neyts, Jean-Michel Pawlotsky, Ventzislava Petrov-Sanchez, Stanislas Pol, Alexandra Rohel, Philippe Roingeard, Anna-Laura Ross, Patrick Soussan, Hélène Strick-Marchand, Camille Sureau, Vincent Thibault, Christian Trepo, Jean-Claude Trinchet, Mirjam Zeisel et Fabien Zoulim. We also acknowledge the 'ANRS Consortium on Humanized Mouse Models for Viral Hepatitis'.
. Illegitimate replication of linear hepadnavirus DNA through nonhomologous recombination. J Virol 1995;69:4029–36.
. Features of two hepatitis B virus (HBV) DNA integrations suggest mechanisms of HBV integration. J Virol 1989;63:2638–43.
. Molecular Biology of hepatitis B viruses. In: Howley P, Knipe D, eds. Fields virology. Lippincott: Williams and Wilkins, 2013:21852221. European Association For The Study Of The L. EASL clinical practice guidelines: Management of chronic hepatitis B virus infection. J Hepatol 2012;57:167–85.
. Entecavir treatment does not eliminate the risk of hepatocellular carcinoma in chronic hepatitis B: limited role for risk scores in Caucasians. Gut 2014.
. Epidemiology, pathogenesis and management of hepatitis D: update and challenges ahead. Nat Rev Gastroenterol Hepatol 2010;7:31–40.
. Hepatitis B virus infection of adult human hepatocytes cultured in the presence of dimethyl sulfoxide. J Virol 1988;62:4136–43.
. The tupaia model for the study of hepatitis B virus: direct infection and HBV genome transduction of primary tupaia hepatocytes. Methods Mol Med 2004;96:153–61.
. Sodium taurocholate cotransporting polypeptide is a functional receptor for human hepatitis B and D virus. eLife 2012;1:e00049.
. State of the (research) chimp. Lab Anim 2012;41:31.
. The middle hepatitis B virus envelope protein is not necessary for infectivity of hepatitis delta virus. J Virol 1994;68:4063–6.
. The nuclear function of Hepatitis B capsid (HBc) protein is to inhibit IFN response very early after infection of hepatocytes. Hepatology 2013;58:276A.
. Inhibition of human hepatitis B virus replication by AT-61, a phenylpropenamide derivative, alone and in combination with (-)beta-L-2′,3′-dideoxy-3′-thiacytidine. Antimicrob Agents Chemother 1998;42:3179–86.
. Transcription of the human beta interferon gene is inhibited by hepatitis B virus. J Virol 1989;63:3065–71.
. HAPs hepatitis B virus (HBV) capsid inhibitors block core protein interaction with the viral minichromosome and host cell genes and affect cccDNA transcription and sta- bility. Hepatology 2013;54:277A.
. Mimicking Interferon-α (IFNα) inhibitory activity on hep- atitis B virus (HBV) transcription and replication by tar- geting the epigenetic control of nuclear cccDNA minichromosome with epigenetic small molecules. Hepatology 2012;56:369A.
. Glucosidase inhibitors as antiviral agents for hepatitis B and C. Curr Opin Investig Drugs 2007;8:125–9.
. REP 9 AC: a potent HBsAg release inhibitor that elicits durable immunological control of chronic HBV infection. Hepatology 2011;54:478A.
. Anti-HBV DNA vaccination does not prevent relapse after discontinuation of analogues in the treatment of chronic hepatitis B: a randomised trial—ANRS HB02 VAC-ADN. Gut 2015;64:139147.
. A phase III clinical trial with a nasal vaccine containing both HBsAg and HBcAg in patients with chronic Hepatitis B. J Hepatol 2013;58:S229–407. , et al. In vivo inhibition of HBV antigenemia and viremia by antisense oligonucleotides. J Hepatol 2014;60:S1–598.
. Restoration of HBV-specific CD8+ T-cell function by PD-1 blockade in inactive carrier patients is linked to T-cell differentiation. J Hepatol 2014;61:12129. MBZ and JL contributed equally.